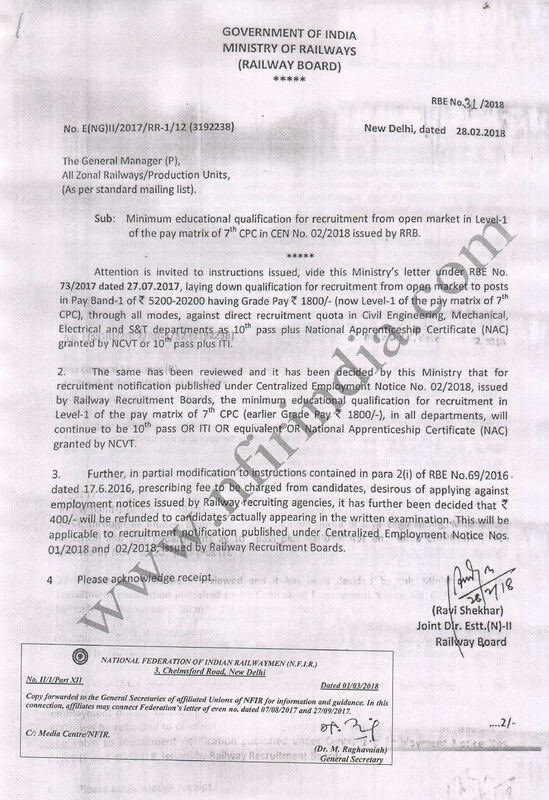 Sub : Minimum educational qualification for recruitment from open market in Level -1 of the pay matrix of 7th CPC in CEN No.02/2018 issued by RRB. Attention is invited to instructions issued, vide this Ministry’s letter under RBE No 73/2017 dated 27.07.2017, laying down qualification for recruitment from open market to posts in Pay Band-1 of Rs. 5200-20200 having Grade Pay Rs.1800/- (now Level-1 of the pay matrix of 7th CPC), through all modes, against direct recruitment quota in Civil Engineering, Mechanical, Electrical and S&T departments as 10th pass plus National Apprenticeship Certificate (NAC) granted by NCVT or 10th pass plus ITI. 3. Further, in partial modification to instructions contained in para 2(i) of RBE No.69/2016 dated 17.6.2016, prescribing fee to be charged from candidates, desirous of applying against employment notices issued by Railway recruiting agencies, it has further been decided that 400/- will be refunded to candidates actually appearing in the written examination. This will be applicable to recruitment notification published under Centralized Employment Notice Nos. 01/2018 and 02/2018, issued by Railway Recruitment Boards.